While theories abound about the exact origin of the French Bulldog, the most prevalent opinion is that around the mid 1800s Normandy lace workers from England took smaller bulldogs with them when they sought work in France. In the farming communities north of France that the lace workers settled in, the little Bulldogs became very popular as ratters and loyal family companions and their population began to swell. These little bulldogs were in fact “culls” of the established Bulldog Breeders in England, who were generally more than happy to sell these undersized examples of their breed to fanciers of the “new” breed in England. This was especially true of the “tulip” eared puppies that cropped up at times in Bulldog litters. The aura of notoriety that ownership of the little dogs conveyed soon made them a fashionable way for the well to do classes to show off how daring they could be, and they soon became favourites of the “artistic” set across Europe. Photos dating to around this time show photos of the Russian Royal family posing alongside their French Bulldogs, and they were said to have imported several of the little dogs from France. It is inarguable that without the influence of dedicated, turn of the century American fanciers the breed would not be what it is today. It is they that organised the very first French Bulldog Club in the world, and it was they who insisted that the “bat” ear so associated with the breed today was correct. Until that time, French Bulldogs were shown with either the “bat” or “rose” ear. As a point of historic interest, a French Bulldog, insured for the at that time astronomical sum of $750, was on board the ill fated Titanic. All in all, French Bulldogs truly are an International Breed, with fanciers of many nations being responsible for the creation of the loving dogs we know today. Contrary to the opinions of many Bulldog fanciers, French Bulldogs are not simply Bulldog Snobs. Neither are they simply miniature bulldogs with ears that stick up. The most frequent comparison owners hear is that they resemble either Pugs with their ears cropped, Boston Terriers on steroids or Vietnamese Pot Bellied Pigs! A smoothly coated member of the Non-Sporting Group, French Bulldogs are recognised by the FCI, The Kennel Club of Great Britain, the AKC and the CKC. While definitely not a rare breed, they are also not that commonly seen. For example, in April of 1995 27 French Bulldog litters were registered in all of the USA, as opposed to 2.512 litters of standard poodles, or 291 litters of Bulldogs. In 1994, French Bulldogs ranked 81st in popularity. Registrations have been climbing steadily for the last twenty years, although no one expects them to break into the top ten most popular breeds any time soon – not that most fanciers want them to! According to the American and Canadian Breed Standard, the maximum weight for a French Bulldog is 28 Lbs. the Average weight for a male tends to be 24-28 Lbs, and for a female 19-24 Lbs. This size makes them a nice, sturdy, smaller sized dog, without the inherent frailty of so many of the Toy breeds. Their bodies are similar in type to the Bulldog, with less exaggeration. For example, while their jaw is also undershot, it is not to the same degree as the bulldog. Neither are their faces as wrinkled as their cousins the bulldog. They should, in general, resemble a sturdy, compact, cobby little dog. Their ears are of primary importance to the appearance of the breed, and should always be “Bat.” Equally important is that elusive something is known as an expression. As a matter of fact, most fanciers will describe “that face” as being one of their primary reasons for choosing this breed. With their gently wrinkled brow, clear gaze and alertly intense gaze, almost no other bred can give as clear an impression that they not only hear you but can understand everything that you say – which is not to imply that they intend to listen! French Bulldogs come in a gorgeous array of colours. In fact, ALL are allowed in the show ring, with the exception of Black (meaning without a SINGLE white or other coloured hair; Black and tan (Doberman Type Colours); Liver and Mouse. The exact nature of these last two colours is the subject of some debate among fanciers, many of whom feel them be rather ambiguous descriptions at best. Heavy ticking, such as that seen on many setters, is to be avoided. In reality, these colour distinctions are relevant only in the show ring. A dog with any of those characteristics could make as equally wonderful a pet as any of the more common Brindles, Creams, or Pieds. For a more detailed discussion of the standard for the French Bulldog, please consult the AKC Standard. Frenchies make excellent pets for either apartments or homes, and they are comfortable as either city dogs or country dwellers. Frenchies in any environment have one overwhelming need, and that is to be in close contact with the person they love. Due to their inability to tolerate either extreme cold or extreme heat, it is not a consideration to house a Frenchie outdoors. Regardless of temperature, a French Bulldog is happiest when with an itŐs owner, and they enjoy long walks or car drives as much as any breed of dog you may hope to meet. I personally take my dogs along with me to work on a regular basis and find that they are quite a congenial addition to the office. They do have the rather disconcerting habit of sitting at the feet of anyone who dares to sit in there in “their” chair and gazing at them unblinkingly until they move. They don’t bark, beg or paw at them, they merely stare. It’s a frighteningly effective tactic to get people to move. There are several congenital diseases and conditions that French Bulldogs are prone to, although they are still considered the healthiest of the Bull Breeds. Frenchies can suffer from Von Willebrand’s Disease (VWD), a bleeding syndrome similar to Haemophilia in humans which can impede their clotting. In conjunction to this, French Bulldogs may also suffer from a thyroid condition. Many breeders follow a program of testing younger dogs for VWD and only testing for thyroid at that time if the VWD factor is low. In this program, the breeder tests thyroid again just prior to using the dog for breeding. Other breeders test both VWD and Thyroid at the same time. As a result of the rather cramped conditions that a Frenchie’s flat face creates, one of the most common defects in French Bulldogs is elongated soft palate or cleft palate. Puppies affected with Cleft palate are generally put down at birth, as it is generally considered to be an almost impossible condition to correct. Elongated soft palate can manifest as anything from a mild condition causing laboured breathing to severe condition that can cause the affected dog to pass out from moderate exercise. One of the most disgusting possibilities in a dog affected with elongated palate is passive regurgitation, in which the affected dog vomits up food or phlegm after eating or exercise. It is generally advisable to ask breeders if either parent has an elongated soft palate, or has ever been operated on for the condition. Another result of the compacted airway of the French Bulldog is their inability to effectively regulate temperature. While a regular canine may suffer to some degree from the heat, to a Frenchie it may be lethal. It is imperative that they are protected from temperature extremes at all times, and that they always have access to fresh water and shade. French Bulldogs can also suffer from an assortment of back and spinal diseases, most of which are probably related to the fact that they were selectively chosen from the dwarf examples of the Bulldog Breed. Some breeders feel that only dogs that have been X-rayed and checked for spinal anomalies should be bred from, but this is a difficult position to take sides on. While it is true that no dog affected with a spinal disease should be bred from, there is a great deal of variance in the appearance of a French Bulldog’s spine as compared to, for example, a Labrador Retriever. If possible, such decisions should be left to either a Vet or breeder who has seen quite a few Bulldog Breed Spinal Xrays, to avoid eliminating dogs unnecessarily. Reputable breeders are struggling to produce dogs that are as healthy as possible, and while these tests are expensive for the breeder to do, they can help to save the puppy purchaser hundreds or even thousands of dollars in potential vet bills. Needless to say, anyone who would consider the purchase of a French Bulldog from a pet store would be further ahead to just sign their life savings over to their vet. In spite of all this, French Bulldogs are still considered to be the healthiest of the Bull Breeds. Actually, some owners tell of having owned Frenchies for as long as six months without ever having heard them bark. I personally owned one that barked so infrequently that when she did it actually sounded rusty! In general, though, most Frenchies as sensible barkers, doing so only if they feel that there is something worth really getting excited about. Whenever I am asked, “How are Frenchies with children?” I like to reply “How are your children with dogs?” As with most dogs, Frenchies will play and rough house happily with older children who have been carefully introduced and taught to respect a dog’s limitations. Smaller children must be carefully taught to never pick a Frenchie up, as they are ahead heavy breed that is easy to drop. Some fanciers believe that Frenchies may play too vigorously for the average child under 2 years, but there is always the exception to the rule. As with your children, it is the way your Frenchie has been taught that will be the deciding factor. Well, quite frankly, a lot. French Bulldogs tend to be rather expensive, for a number of reasons. They are generally able to deliver only by Caesarean, have very low litter sizes, and usually need to be artificially inseminated. All of this tends to keep their prices rather high. Please ensure that if you find one that seems to be a bargain that it wasn’t by virtue of their care being skimped on. No! They are French, and as such would never be caught dead doing anything as uncouth as drooling – they leave that to their British Bulldog cousins! 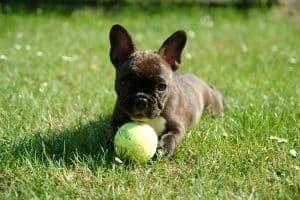 Is A Frenchie Right For Me? While French Bulldogs may not have the easily trained disposition of Border Collies, they are easily trained to basic obedience commands, and quite a few have competed successfully in the obedience ring, even earning U.D. titles. Frenchies, with their gentle nature and love of attention, make excellent therapy dogs but are not the breed to choose, however, if you are seeking a vigorous jogging companion or highly athletic dog. Their joints were not made to take the stress of constant pounding, and their impaired breathing can make heavy activity life threatening in extreme weather conditions. If there was ever a couch potato Olympics, on the other hand, I am quite sure that most of the Gold Medal Winners would be French Bulldogs. 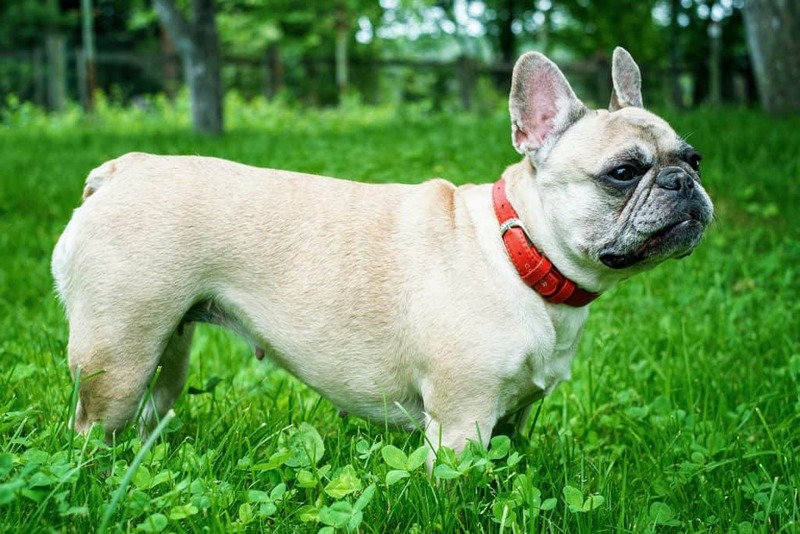 If you enjoy leisurely walks, long drives or pleasant outings to the park then a Frenchie just may be the dog for you!